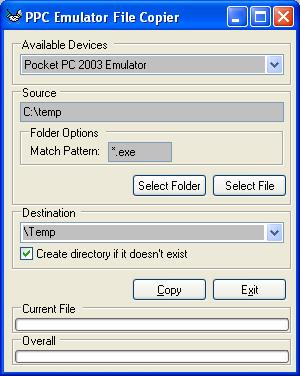 This program will let you send one for more files at a time to any of the Pocket PC emulators installed on your system. I originally used Alex Feinman’s EmuCpy which is command line based and only lets you send one file at a time. I was sending enough files to the emulator that it became apparent to write a frontend to quickly send files over the Pocket PC.